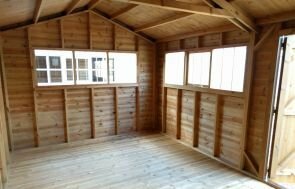 An attractive building, this 3.0 x 2.4m Superior Shed has been installed at the bottom of our customer’s garden in Uley, Gloucestershire to use as a place to store their ride-on lawnmower. 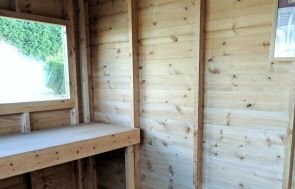 Surrounded by the beautiful Gloucestershire countryside, the customer wanted a practical shed, but one that would also be appealing to the eye and fit in with the landscape. For this reason, they chose to have cedar shingle tiles on the roof, weatherboard cladding for a rustic look, Georgian windows, and the paint is Farrow & Ball’s Old White. When the cedar shingles age, they will silver and blend in nicely with the white of the paint. 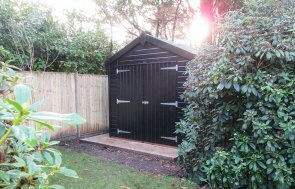 The customer chose to have black guttering added to the sides of the shed to catch excess rainfall. Internally, the customer chose to have our heavy duty flooring due to the heavy machine that will be stored inside it. Our heavy duty flooring is ex 38mm thick, as opposed to the standard flooring, which is ex 19mm thick. 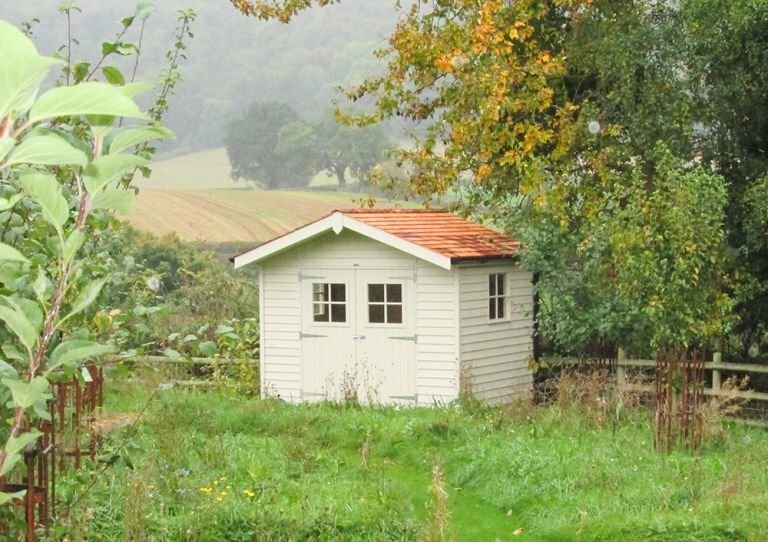 For more information on our range of Garden Sheds, please contact us online, or create your own bespoke garden building using our online price builder. Alternatively, come and visit one of our show centres across the country.